Filtrite Corporation is located just minutes off Highway 41 in Fresno. Take 41 North and exit on Shaw Blvd. Head west to N. Blackstone Ave. Turn Left on Blackstone, head south. 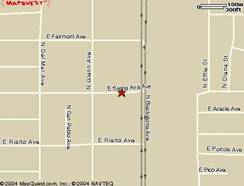 East Santa Ana Avenue is past East Fairmont Avenue, but before Rialto.